KBSS can access the air operated tensioner pump unit which is designed and constructed to be failsafe, user friendly, lightweight and compact. The unit works on a simple but efficient principle, magnified through differential piston areas. A large piston drives a smaller hydraulic piston, which provides flow at high pressure. 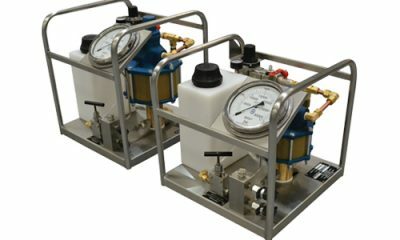 Although the pumps are compact, all the usable components are located within easy to reach places, with the large, simple to read gauges and equally large dial positioned clearly at the front of the pump. For durability, the frames are also made of stainless steel to protect against corrosion.